Here are some fantastic reasons why getting married in the Fiji Islands makes so much sense. PRESSURE FREE  Fiji provides an idyllic escape from the pressure of organising the wedding at home. Most resorts have a series of wedding packages from which to choose. HAVE AN ENTIRE RESORT TO YOURSELF  In Fiji wedding parties are often able to take over whole resorts allowing total privacy. CENTRAL LOCATION  Centrally located and providing easy access for friends and relatives Fiji provides a neutral zone for all those coming from around the world. Many families have extended families and what better place to have a reunion than the beautiful shores of Fiji. ACCESSIBILITY - Given Fijis popularity as a holiday destination many reasonable travel packages are available throughout the world. FREQUENCIES OF FLIGHTS - There are frequent flights to and from Fiji with Air Pacific flying up to 12 times in a week. GROUP TRAVEL DISCOUNT  wedding parties will frequently qualify for group travel discounts. Your guests will be able to enjoy a holiday at a much better rate than they could buy on their own as this provides a fantastic excuse for your guests to indulge in a holiday break. HASSLE FREE DOCUMENTATION  Any official documents you need are exactly the same as getting married in any part of the world. SPEED OF OFFICIALDOM  With your marriage licence able to be processed in one day travel plans can easily be arranged. 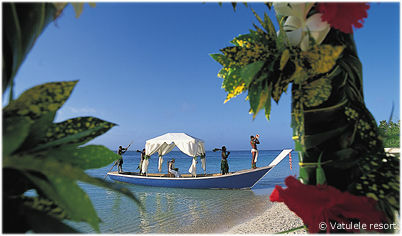 KEEPING DOWN THE NUMBERS  Fiji can provide a great way to keep the intimacy of the occasion. Invitations for a wedding in Fiji can be readily made without necessarily being accepted. This reduces your overall costs. A CHOICE OF BEAUTIFUL LOCATIONS  Without doubt the azure oceans and pristine beaches are the major attraction to plan your wedding around. Yet sparking waterfalls, tropical forests or even a resort provide a number of settings, each one as magnificent as the last. A mix of colonial and modern architecture provide wedding and reception options. THE CULTURE  With its beautiful traditions of song and dance, Fijian culture can be a beautiful part of your ceremony from the marvel of fire walking to the beautiful voices of the people around you. NO TRAVEL WORRIES  The stunning setting comes without travel worries. No dangerous animals or insects and free from diseases such as malaria, the beautiful scenery with its swaying palms add to the romance of your visit. FANTASTIC FOOD  Dont forget the wonderful food! Local specialities combined with a mix of international flavours provide first class cuisine. Once again your choice from formal dinners to casual dining or even a picnic by the beach. FANTASTIC PHOTO OPPORTUNITIES  With heavenly sunsets and scenery out of a movie Fiji provides an amazing backdrop for wedding photos. THE WEATHER  Enjoy an ideal South Sea environment and have your wedding under sparking skies. Some areas of Fiji can go for six months without a drop of rain. A RANGE OF ACTIVITIES  If lying in the sun all day doesnt appeal, a whole range of activities are available, particularly in the water. ARRIVE IN TRADITIONAL FIJIAN STYLE  Have a group of Fijian warriors carry you above their heads in the traditional Fijian way on a platform to the ceremony. ON SITE BEAUTY ADVICE  With a beauty clinic at major resorts book yourself in for that pre-wedding pampering. A CHOICE OF ACCOMMODATION  A range of accommodation choices to suit everyones budget from fabulous first class resorts to more family or budget orientated accommodation. LOW COST  The biggest surprise is cost  many Fijian wedding packages are cheaper, with optional extras to suit your budget. Couples can choose to have everything from a simple ceremony to a complete island feast. NO RECEPTION ROOM HIRE FEE  None of the resorts charge for venue hire lowering your costs significantly. All you pay for is the food and drinks you consume. THE FRIENDLY PEOPLE  With a genuine friendliness the hospitality of the Fijian people is renowned. Their warm welcome adds something special as weddings are celebrated with great joy. EVERYTHING ORGANISED FOR YOU  Resorts will happily organise all details including arranging all legal requirements and all the resorts in this guide have a wedding coordinator  you just relax. A CHOICE OF CEREMONIES  With option of integrating traditional ceremonies for something unique the many cultural influences that make up Fiji allow ceremonies to be blended for your choice of ceremony. NOT HAVING TO TRAVEL FOR YOUR HONEYMOON  what better way to start your honeymoon than simply walking up the beach. A CHOICE OF ISLANDS  with over 330 different islands you can choose how remote or busy you want your wedding location to be.